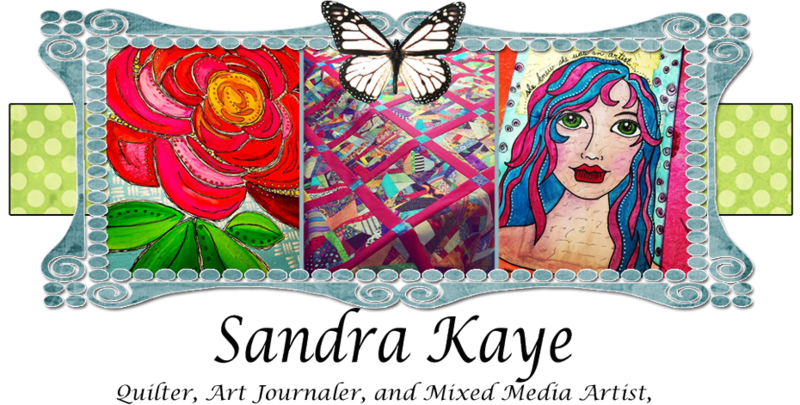 Sandra Kaye: The Last of My Christmas!! Well, I am very sad to see Christmas put away!!! I love my house all decked out for the holiday :):) I wanted to show you a project I made for the many Christmas' to come. 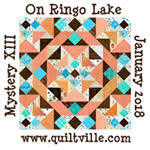 As most of you know I have hosted a quiltie trade here on my blog for the last two years. I decided to pull all the Christmas themed quilties together into one project...so I can enjoy them year after year. So, I made the above quilt in the month of December. I wanted to get it done..so I can just pull it out next December and have it ready :):) Next, I will show them up close so you can see better, and tell you who made what. This is not a quiltie but, my good friend Lesley from Canada made this for me...and I wanted it to be the center piece to this project. Thank you Lesley!!!! Tova from Arizona and Cheryl from New York!! 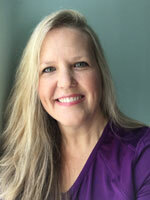 Marilou from California whom I affectionately call MammaLou :):) She was my very first blog friend!!! .....and my Best friend I left in Florida...Lori!!!! 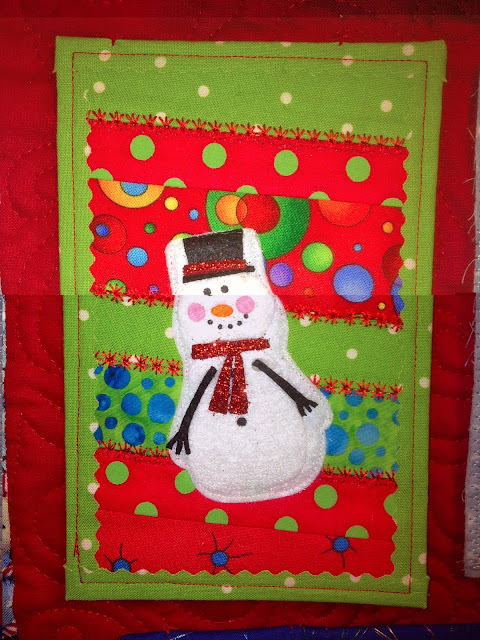 ...and now the quilting I did on the snowman fabric... I did free motioned stars and loops! 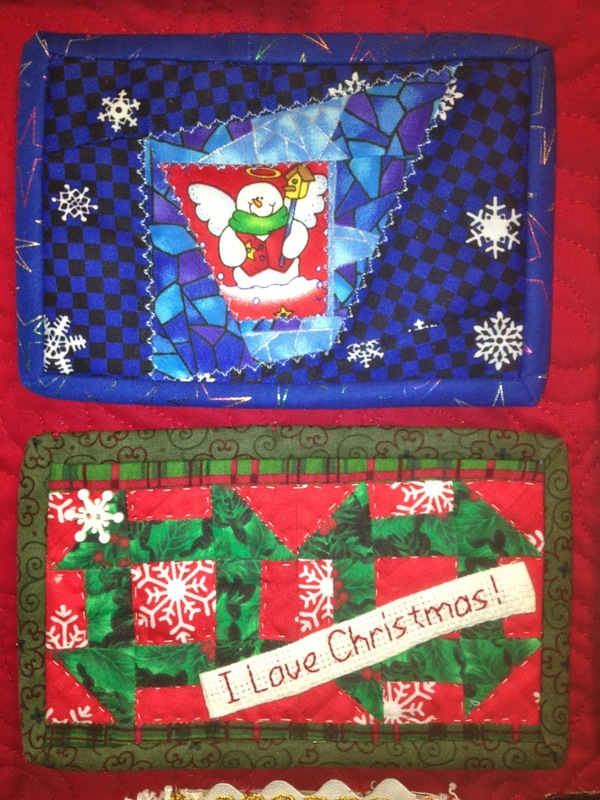 I really want to thank each and every lady who made these Christmas quilties for me!!! 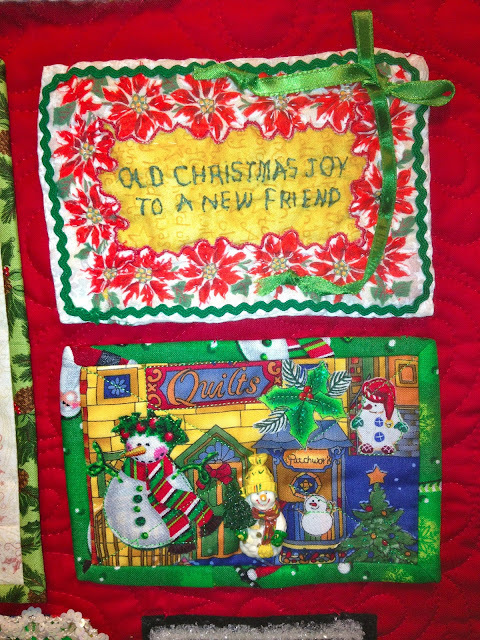 Oh Sandie, what a treasure this quilt is!I love it! It must make you smile evry time you see it.I've never even seen snow, much less ,ade a snowman, but they are cute motifs aren't they! 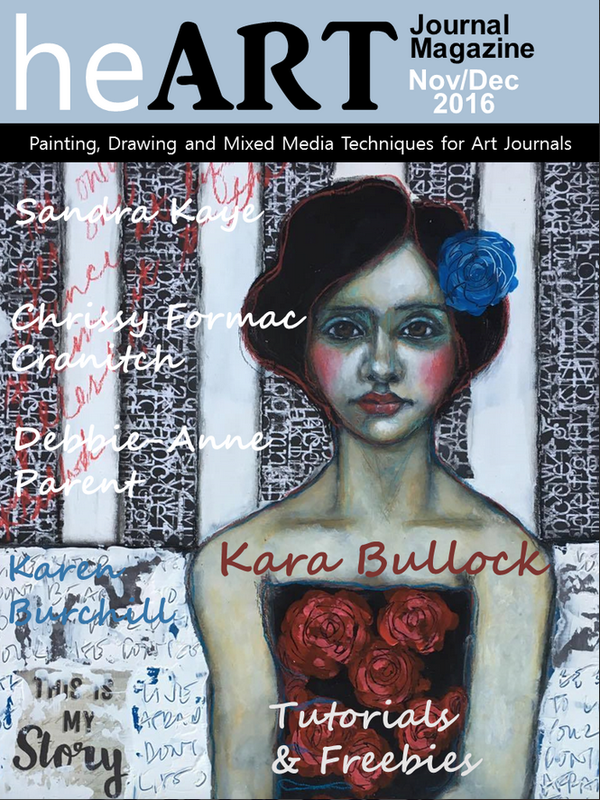 I have just made a post about the joy of having Pieces of art that people make for us to remember them by. The quilt turned out beautiful. 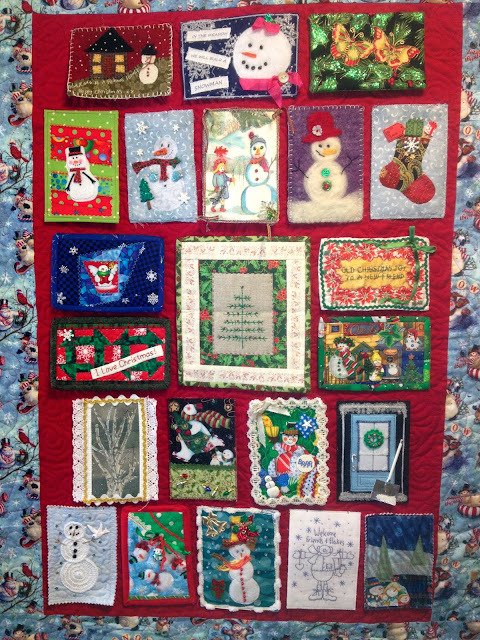 What a great way to preserve and enjoy the quilties and the memories of friends. Enjoyed seeing your quilt. 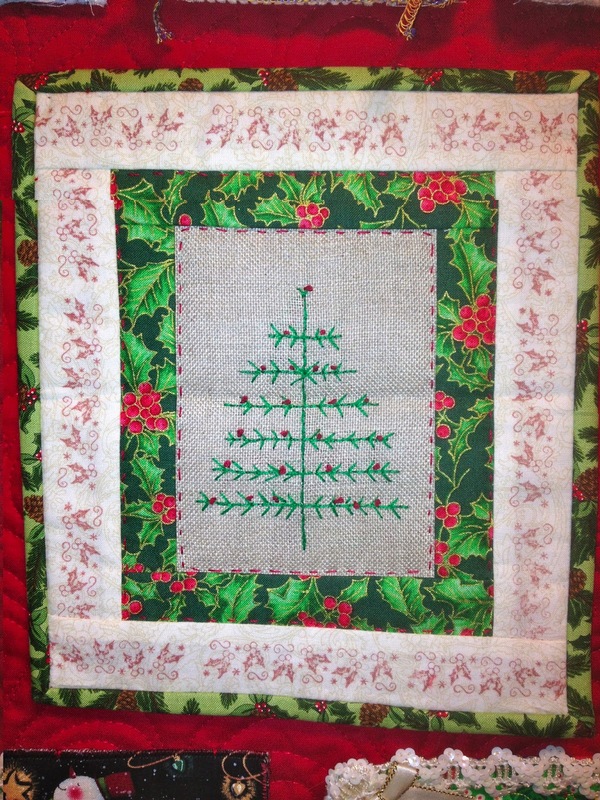 It is a most love Christmas quilt, you should enjoy it for years to come. Sandie, you have created a beautiful quilt! 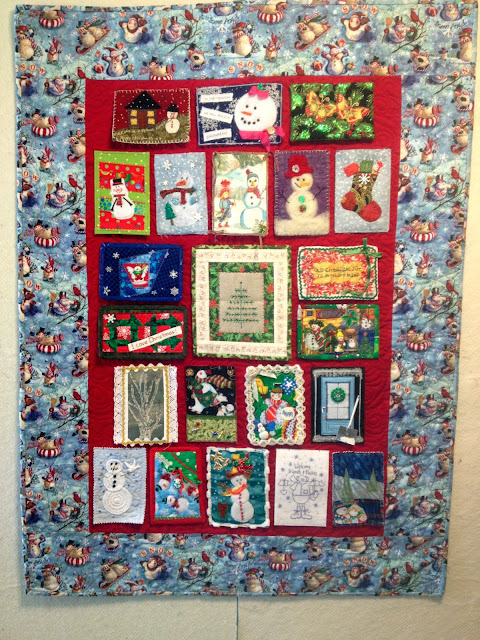 The way you arranged the quilties, and stitched them so you could read them is so unique and results in a quilted work of art! Love the way you quilted this. It (almost) leaves me speechless...way to go! 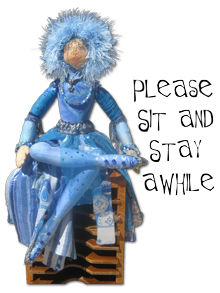 It's wonderful to have you as a blog friend! A wonderful Christmas keepsake. Great job everyone! Such a clever way to group and display these! It's just lovely, and absorbing to look at each little quiltie. Well done. I love this too, what a great idea. Thanks for sharing. What a wonderful gift from your friends and to yourself! 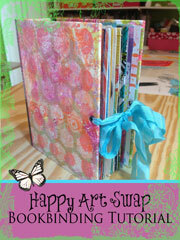 What a great idea Sandie and I love that you can flip them to see who created each one. What fun. 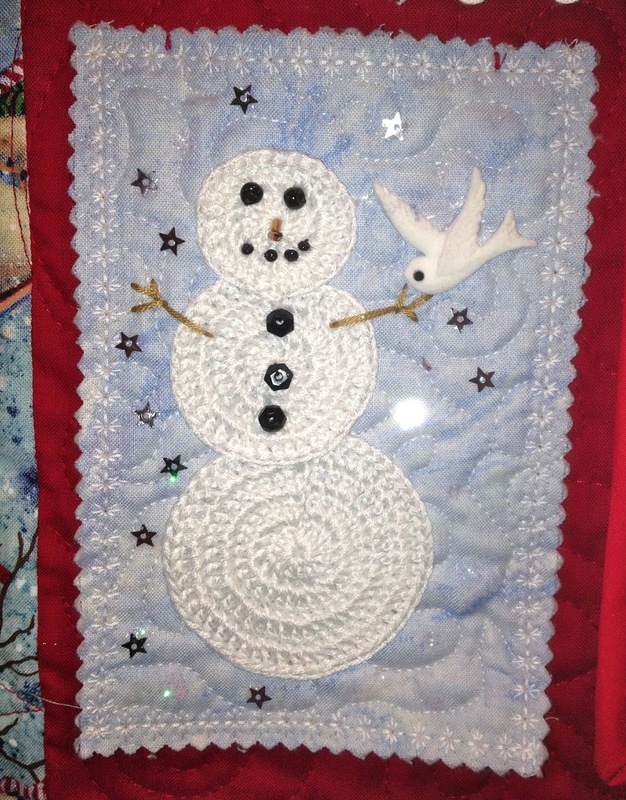 I'm sure glad I made you a snowman quiltie last year! 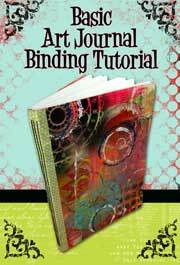 Gosh Now I Love This Project Too and Want To Make One!! Will count my Christmas quilties, won't have nearly as many as you. Maybe an all seasons wall hanging! AWWW! What a wonderful idea. I just love each and every one of those cards. And together they are adorable!